Crunchy tortilla shells, twice cooked so you can load them up with tender seasoned beef, a mountain of grated cheese, crisp lettuce and a tangy salsa. Heat a pan with a splash of oil, brown the mince and drain off the excess. Sprinkle in the Old El Paso Original Spice Mix for Tacos and tip in 100 ml water. Give it a good stir and when it starts to bubble, reduce the heat and simmer uncovered for 10 minutes. Stir occasionally until it reduces to a rich, tasty minced beef filling. Fire up the oven to 180°C (160°C for fan assisted ovens), gas mark 4. Lay the Crunchy Tortilla Shells open end down on a baking sheet or some foil and heat for 2-3 minutes. To microwave, give it about a minute for 6 tacos and slightly less time for fewer. 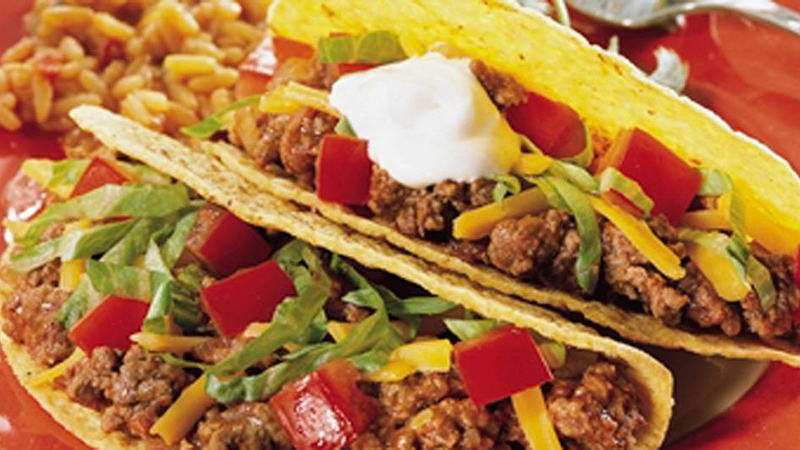 Load up the toasty taco shells with the hearty seasoned beef, crispy lettuce, juicy tomatoes, grated cheese and Old El Paso Taco Salsa. Now round everybody up in the kitchen or around the tv and get crunching!